On this trajectory that could rise to nearly 200,000 excess deaths by the end of 2020, even with the extra funding that has been earmarked for public sector services this year. Real terms funding for health and social care fell under the Conservative-led Coalition Government in 2010, and the researchers conclude this “may have produced” the substantial increase in deaths. The paper identified that mortality rates in the UK had declined steadily from 2001 to 2010, but this reversed sharply with the death rate growing again after austerity came in. From this reversal the authors identified that 45,368 extra deaths occurred between 2010 and 2014, than would have been expected, although it stops short of calling them “avoidable”. The Government began relaxing austerity measures this year announcing the end of its cap on public sector pay rises and announcing an extra £1.3bn for social care in the Spring Budget. Over three years the additional funding for social care is expected to reach £2bn, which Labour leader Jeremy Corbyn said was “patching up a small part of the damage” wrought by £4.6bn cuts. The study, published in BMJ Open today, estimated that to return death rates to their pre-2010 levels spending would need to increase by £25.3bn. The Department of Health said “firm conclusions” cannot be drawn from this work, and independent academics warned the funding figures were “speculative”. However local councils who have been struggling to fund care with slashed budgets urged the Government to consider the research seriously. Shadow Health Secretary Jonathan Ashworth said the Government must match Labour’s spending pledges in the Autumn Budget. Per capita public health spending between 2001 and 2010 increased by 3.8 per cent a year, but in the first four years of the Coalition, increases were just 0.41 per cent, researchers from University College London found. In social care the annual budget increase collapsed from 2.20 per cent annually, to a decrease of 1.57 per cent. The researchers found this coincided with death rates which had decreased by around 0.77 per cent a year to 2010, beginning to increase again by 0.87 per cent a year. Get involved with the People’s Assembly today. This entry was posted in Austerity in UK, Conservatives, Defend NHS, Fight the Cuts, Inequality, LibDems Quislings, Save the NHS, Solidarity, The People's Assembly Derby, X Conservative Party Paymasters and tagged Austerity Fight The Cuts, BEDROOM TAX, Conservative Party Paymasters, Conservative Party Vampire Squids, Derby, Derby People's Assembly, Derby People’s Assembly against Austerity, DERBYSHIRE, Fight Austerity, Fight the Cuts, Food bank, KEEP OUR NHS PUBLIC, Mental health, National Health Service, NHS SOS, PRIVATISATION OF NHS, Solidarity, STOP NHS PRIVATISATION, STOP PRIVATISATION OF THE NHS DERBY, Stop the Cuts, Trade Unions, WELFARE. But this week the Department for Work and Pensions disclosed under government transparency rules that Mr Duncan Smith had held a meeting about child poverty with the US investment bank JP Morgan Chase. This entry was posted in Food Banks, IDS, Poverty, Solidarity, The People's Assembly Derby and tagged Austerity Fight The Cuts, Derby, Derby People's Assembly, DERBYSHIRE, Food bank, IDS, Poverty in UK. 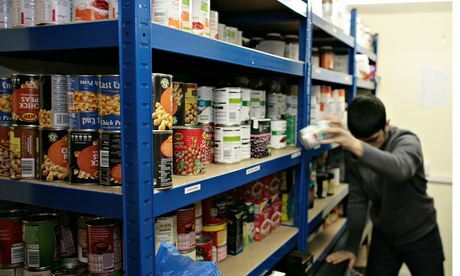 The government’s welfare reforms, including benefit sanctions and the bedroom tax, are a central factor in the explosion in the numbers of impoverished people turning to charity food banks, an academic study has said. That report concluded there was insufficient evidence to demonstrate a clear causal link between welfare reform and food bank demand in the UK. But Lambie-Mumford’s new study, to be published on Wednesday, says the rise in demand for charity food is a clear signal “of the inadequacy of both social security provision and the processes by which it is delivered”. The report warns that as social security safety nets become weaker, there is a danger that charity food could become an integral part of the state welfare provision, or even an replacement for formerly state-funded emergency welfare schemes. Lambie-Mumford’s study was based on 25 in-depth interviews with a range of food bank staff and volunteers in 2012 and 2013 and found many food banks were adapting to demand by scaling up food collection and storage provision “to accommodate the future trajectory of need”. Her paper will be presented to an all-party committee of MPs which meets on Wednesday to finalise the terms of an inquiry into hunger and food poverty. The inquiry will examine the rise of food banks, an issue that has become politically charged as ministers attempt to deflect criticism that austerity policies, including welfare cuts, have had the effect of compelling more people on low incomes to rely on food aid. Lambie-Mumford said her research showed that food banks were expanding to meet rising demand caused in part by a squeeze on welfare entitlements which made already poor people even worse off. This was compounded by inadequate processing of social security claims, including payment delays and “arbitrary and unfair” sanctioning decisions that left claimants without any income at all. There were other factors which had contributed to the rise of food banks, such as low wages and the rise in the cost of food. But it was important that MPs did not duck or underplay the importance of welfare reform. “The tricky thing is that welfare reform is the most political aspect of a political issue. But we should not shy away from it for this reason,” she said. The welfare minister Lord Freud notoriously claimed last year that more people were going to food banks because the food was free, thereby triggering “almost infinite demand”. Last month Freud admitted people did not turn up “willingly” at food banks but said it was “very hard to know why” they did go. The Trussell trust, which oversees a network of more than 400 food banks in the UK, has insisted repeatedly that welfare reform is the biggest driver of demand for food parcels. Its third-quarter data, published in March, showed that it helped 614,000 people in the first nine months of this year. Its final-year figures, expected next week, are likely to show that demand has more than doubled in the past 12 months. More than eight out of 10 food bank managers interviewed for the study acknowledged the impact of welfare changes and welfare processes as a factor in driving demand. A DWP spokesperson said: “This report, which is based on just 25 interviews, fails to consider how welfare reforms are helping people off benefits and into jobs. The truth is that we now have record numbers of people in work, the highest employment rate for five years, and falling unemployment.” A DWP spokesman later added that the report “gave a one-sided view”. This entry was posted in Austerity in UK, Fight the Cuts, Food Banks, Inequality, Solidarity, The People's Assembly Derby and tagged Austerity Fight The Cuts, Derby, Derby People's Assembly, Derby People’s Assembly against Austerity, DERBYSHIRE, Fight Austerity, Food bank, Food Banks, Solidarity, Welfare reform. Disabled people feel terrorised by the Government’s welfare policies and want the truth on how their lives have been affected, MPs have heard. John McDonnell has criticised the impact of the Government’s welfare reforms. A petition started by comedian Francesca Martinez, who has cerebral palsy, attracted 104,741 signatures to trigger a Commons debate, which called for an independent assessment of the coalition’s welfare system changes. Excess deaths of welfare claimants, Universal Credit’s IT roll out, the use of Atos to conduct work capability assessments and the Remploy factory closures are among the issues in need of investigation, according to a motion from Labour’s John McDonnell. The MP for Hayes and Harlington said many people felt “hounded” just for being disabled. “That’s why the central demand of this petition is very straightforward. Today’s motion is to call in essence for a cumulative impact assessment of all the welfare changes that have been introduced by this Government. “And the argument they’ve put forward is if politicians and society only knew the full effect of these changes on the lives of disabled people and their families surely they would not let this happen in a civilised society. This entry was posted in ATOS, Austerity in UK, BEDROOM TAX, Benefits Street, Conservatives, Disabled, Inequality, LibDems Quislings, Solidarity, The People's Assembly Derby, X Conservative Party Paymasters and tagged austerity, Austerity Fight The Cuts, BEDROOM TAX, Benefits Street, Cuts, Derby People's Assembly, Derby People’s Assembly against Austerity, DERBYSHIRE, Food bank, government austerity measures, liberal democrats, Solidarity, Stop the Cuts. Bone, it must be stressed, fully denies the allegations, and legal formalities forbid comment. The Mirror’s scoop comes as part of an extensive research exercise with the GMB union and is gleaned from freedom of information requests. It is understandable that the Royals grab the headlines – these payments represent a little cherry on top of the whole cake of the civil list and personal wealth that fund a lavish lifestyle of privilege earned only through accident of birth. But appropriately enough, they feature here as merely the salient symbols of a system that is rotten. The full list of private landlords growing rich from taxpayers’ handouts is like a who’s who of the landed aristocracy, the great and the good. 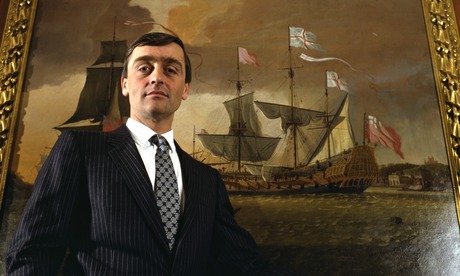 There is the Duke of Westminster, inevitably – the eighth richest person in Britain – whose Grosvenor Group scoops £243,000. Ninth Baronet Sir Richard Sutton is grabbing £68,000, a paltry sum compared with the £195,000 paid to Lord Robert Iliffe. And a Tory politician, Richard Benyon MP, with a personal wealth of £110m, is bringing in pocket money of £626,000 per year in housing benefit. Elsewhere, less illustrious and notable names are doing quite nicely out of the system too. Faceless corporations with addresses in the Cayman Islands or Guernsey, of course. Or those who mine gold from the grimmest depths of poverty, such as the owners of one hotel in Glasgow, who claimed over £1.5m from housing the homeless in squalid, rat-infested rooms. Nobody knows exactly how much of the nation’s benefits bills goes directly to private landlords. One recent estimate put the bill at £35bn over three years. The situation is largely a consequence of a degraded social housing stock that can be traced back to the right-to-buy policy and the liberalisation of the rental sector of the 1980s. Whereas once council housing served to keep housing affordable, and rent controls and protected tenancies acted as buffers for those in the private sector, the open market has led to galloping costs, creating a direct river of cash that flows direct from the less wealthy taxpayers to the wealthy and – all too often – the tax evader. Meanwhile, the one available tax policy that would have a chance of recouping some of this vast wealth – a land value tax – remains mysteriously unpopular with political parties. This entry was posted in ATOS, Austerity in UK, BEDROOM TAX, Benefits Fraud, Benefits Street, Conservatives, ESA, Fight the Cuts, Food Banks, Housing, Hunger, Inequality, LibDems Quislings, Solidarity, The People's Assembly Derby, X Conservative Party Paymasters and tagged Austerity Fight The Cuts, Derby, Derby People's Assembly, Derby People’s Assembly against Austerity, DERBYSHIRE, Fight Austerity, Food bank, Solidarity. 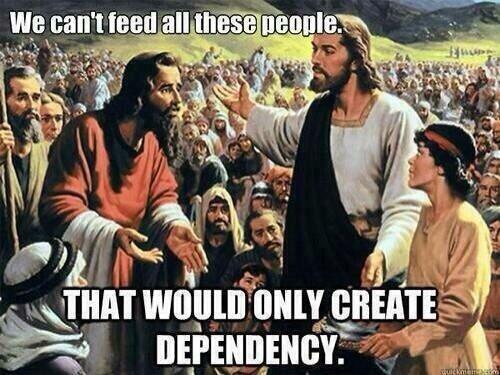 What If Jesus was a Tory? This entry was posted in Austerity in UK, Benefits Street, Food Banks, Solidarity, The People's Assembly Derby and tagged Austerity Fight The Cuts, Benefits Street, Derby People's Assembly, Derby People’s Assembly against Austerity, DERBYSHIRE, Fight Austerity, Food bank, Solidarity.